The Clark County Desert Conservation Program (CCDCP) wanted a game that would teach children about desert plants and animals. The project turned into a wonderful example of the creativity of the Zee Designs team, which turned a simple idea into something amazing: The Mojave Max Kid’s Adventure Page. 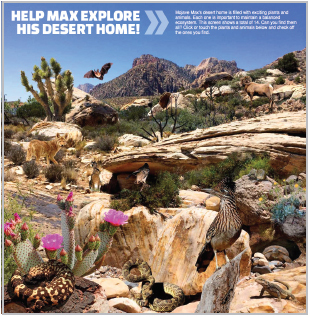 Loren took most of the photography that became The Mojave Max Kid’s Adventure page while on a hike with his children. He used a blend of three different background shots. He then added several images of plants and animals which were not a part of the original photo. Some of the animal photos came from CCDCP. The composite image that he crafted is a wonderful work of art. There was quite a bit of discussion about how to make it friendly and appealing to the eye for children, yet still make it interesting for adults. Loren was perfect for this project because he created the character illustration of Mojave Max, has a vast professional portfolio, and has three young children. Justin Kramer, one of our programmers, is the one who actually made the game come alive. He made the list of 14 plants and animals below the picture interactive. 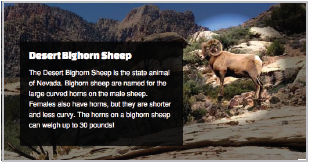 Hover over a plant or animal on the picture, and it will be spotlighted as a pop-up with information appears. Click on the picture, and the plant or animal is checked off the list. The challenge is to find all the desert plants and animals. The previous Mojave Max website was kid-friendly, but didn’t have anything interactive. The Kid’s Adventure Page added the interactive dimension to the new site. The graphics are colorful and dynamic, as well as inviting and engaging for all ages. The information imparted is suitable for both children and adults. Content for each plant and animal on the page is editable from the ZD-CMS™, so it can be changed over time. It can be used at home or in a classroom setting to teach with fun. The intriguing facts about the animals and plants will spur further investigation and learning. in our work when we can offer creative and elegant solutions for our clients.